Have an out of this world summer at Explorers Camp! Campers will explore alongside Chabot Science Educators inside our science labs and museum spaces, and outdoors in Redwood Regional Park. Our summer camps are designed to be active, highly engaging, and are tailored to students entering 1st-6th grades. 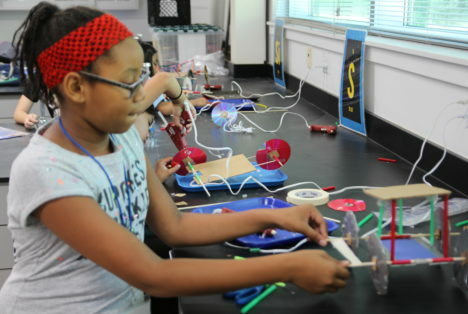 Join us for week-long, thematic camps and become an innovative, creative, and confident problem-solver through immersive, hands-on science experiences! Prepare for launch with a team of fellow astronauts! Gather mission critical information as you explore the cosmos, and design, build, and test solutions for traveling to and surviving in space. At the end of the week, you’ll climb aboard our spaceship simulator and embark on a mission to outer space. Start innovating and unleash your creativity with Project Create! 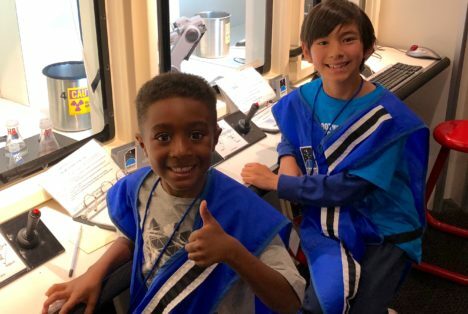 Allow your imagination to run wild as you use real tools to create wearable tech, build with a variety of materials, experiment with coding, and present your creations at a Friday showcase. Set out on an adventure to investigate the superpowers of science like strength, speed, flight, and invisibility! Then, invent your own superhero and join forces with your fellow campers to help protect planet Earth! Step 1: Review our FAQ below. Step 2: Complete one registration form per child. Step 3: Complete one payment form for your entire order with a credit card. Sign in to receive your membership discount, which will be reflected at check out. Click here to become a member! At Chabot, we strive to make camp accessible for all. We have some financial aid available based on financial need and availability of funds. The financial aid application window is now closed. While we cannot guarantee that all families who applied for aid will receive it, we will be reviewing applications and letting families know about awards by May 31, 2019. Help us make camp a reality for everyone by donating to our camp scholarship fund. 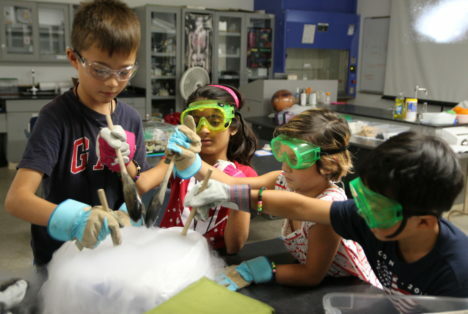 Contact development@chabotspace.org to discuss summer camp scholarship donations. Camp costs $495 per week. There is a $50 discount per week (per child) for Chabot members. A limited number of scholarships are available for families with financial need. See the scholarships section for more information. Before care is $25 and after care is $75 per week for all weeks. Payment is due at the time of registration in the form of a credit or debit card. Cancellations can be made before May 1, 2019 and are subject to a $100 per child penalty. No refund of fees for camp or extended care are available after May 1, 2019 for any reason, including illness. If a child is sick or needs to miss a portion of the week for any reason, those days cannot be made up on a different week. We encourage campers to sign up for as many camp themes as possible! Your child is welcome to attend each camp theme more than once, but be aware, some of the same content will be repeated from week to week. *Each camp’s schedule will vary slightly based on the specific activities of the day. Campers are placed in different groups based on the camp session and grade levels listed below. Each Friday afternoon, we will have an end-of-camp celebration and presentation. All family members are welcome to attend from 3-4 PM. Outside of this time, we ask that adults not attend camp with their child. If there are special circumstances, please contact us directly. Each group of campers will be assigned a camp educator, counselor, and intern for the week. Volunteers may also provide additional support for activities. Campers are supervised at all times by adults. Early care is available from 8-9 AM and after care from 4-6 PM. Activities include additional science investigations, games, outdoor time, and museum explorations. Camp takes place from 9 AM to 4 PM daily. Drop-off takes place from 8:50-9:00 AM. On Monday, drop off will start at 8:30 AM. Please park and bring your child to the registration table just inside the Center entrance. Early care drop off is at 8 AM daily. If you arrive early, please wait with your child until we open at 8 AM. Please sign in with staff before leaving. If you arrive after 9 AM and no one is at the front entrance, please bring your child inside and the front desk will direct you to the group’s location. Pick-up takes place between 4-4:10 PM at the front entrance. Please sign out with a photo ID before leaving. Your child must be picked up by 4:10 PM for the regular program or 6 PM for after care. Beyond this time, a $1/min late fee will be assessed. We strongly discourage early pick up, but if you need to pick up your child early, contact the Camp Director or visit the front desk as early as possible. Due to limited staffing and activities taking place in various locations inside and outside, we may need some time to assist you or locate your child. There is free parking available onsite in our parking garage. Please be sure to bring all your valuables inside with you and secure your vehicle. Please pack a daily lunch, afternoon snack, and water bottle for your child. There will be opportunities to fill water bottles. No food will be provided by Chabot. Children may not share food with others due to safety and health considerations. A camp T-shirt will be provided as a part of the program. If rain is in the forecast, wear appropriate clothing (rain jacket, rain boots, etc.). In light rain, outdoor activities will still take place. We do not offer refunds due to weather. Please label everything with your child’s name. We will do our best to track lost items and have a Lost and Found bin at the end of each day. Please leave all candy, gum, toys, electronics, games, and valuable items at home. Chabot will not be responsible for these items. If a cell phone is absolutely needed, please ask the child to leave it in his/her backpack, only to be used for emergencies. We do not allow drugs, alcohol, tobacco, weapons, or any other illegal or inappropriate items at camp. Be Respectful – be respectful to other campers, camp staff, camp facilities and the environment. Be Responsible – be responsible for your belongings and materials, listen to instructions, and use tools and materials appropriately. Be Safe – to make sure camp is a safe environment for everyone, use appropriate language, use tools appropriately, stay with your group, and do not share food. If there is a minor issue, the camper will first be given a warning. If the behavior continues, we will call you to explain the situation and ask you to talk to your child on the phone. Ongoing disrespectful behavior may be cause for dismissal from the program. Additionally, we have a zero tolerance policy for campers who deliberately physically harm other people or damage property. Please review these expectations with your child prior to camp. Staff is not permitted to administer medication. However, if your child requires medication during camp, we can store it in a secure location and provide it to the child for self-administration at the appropriate time. This includes inhalers and EpiPens. All accidents will be documented with an incident report. For minor scrapes or cuts, we will provide small bandages. For more serious injuries or medical emergencies, staff will contact you and/or your emergency contacts immediately. You may be required to pick up your child. An ambulance or paramedic will be called if necessary. If your child is sick, please do not send him or her to camp so we can maintain a healthy environment for other campers. If your child becomes sick or injured during camp, we will notify you to come pick him/her up. Note that there is Poison Oak in some off the outdoor areas we will be exploring during camp. We will help campers identify and avoid it. To be safe, please wash your child’s clothes and bathe your child at the end of each day. Chabot Space and Science Center has an evacuation plan for fire, earthquakes, and other emergency situations. All campers and staff will be moved to a safe location nearby. All registration information submitted will be held confidentially except in emergency situations that require contact and sharing critical medical information.